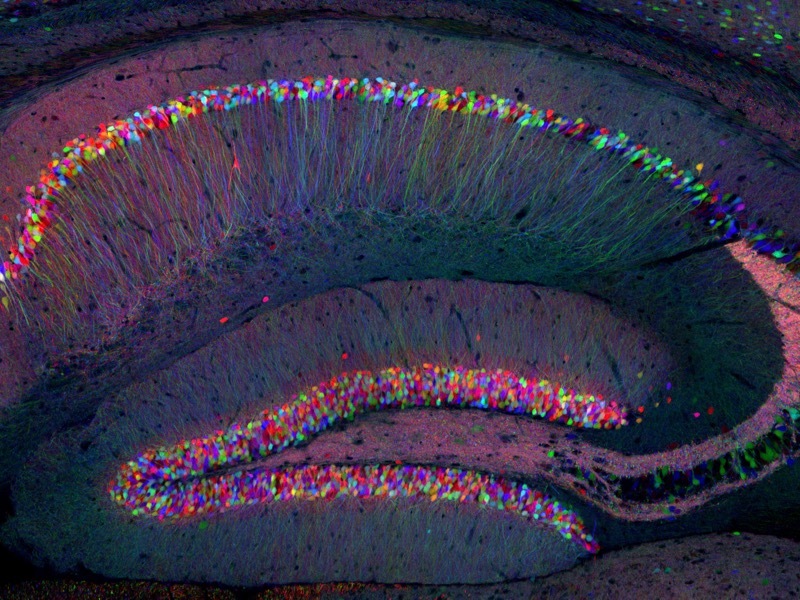 Image: Mouse-brain cross-section, viewed under fluorescence microscopy. Credit: Livet, J., et al. 2007, Nature, 450, 56. The York University Biophysics Contest is a competition for Ontario high school students to create a presentation on a topic in the field of biophysics. The contest aims to investigate a rapidly growing frontier of science, and to promote skills in the communication of science. The goal is to demonstrate the interdisciplinary threads that connect together the physical and life sciences, which can seem and feel like disparate areas of science in high school and university! The main goal of the contest is for you (and potentially a small group of classmates) to visually tell a "story" that relates a fundamental physical concept to a basic biological (or biomedical) topic. This will be done by virtue of creating a single-page "poster". Posters should creatively display information to viewers in an eye-catching-easy-to-digest manner. Posters should tell a “story” visually (i.e., via effective graphics), demonstrating a cohesive and logically structured narrative. While some text can play a vital role, it is (strongly) suggested that text not be the central feature of the poster, and thus be kept to a minimum (i.e, a few well-chosen words). A potential scheme for posters would include background information about the chosen physical concept, an introduction of the associated biological/biomedical idea or application, and details about how that gap is bridged. BE CREATIVE in the layout of this information as clear story-telling, innovative visual display and content all will be key judging components. ** As a reference, an example of one approach to this last topic (Diffusion) can be downloaded here. Note that this example is simply for general illustrative purposes. You may work in groups of 1-4 students, comprised of students from either grades 9-10 or grades 11-12. All members of the group must be students currently enrolled in an Ontario high school. Students who are interested in participating in the York University Biophysics Contest should register by clicking the button in the banner at the top of the page or by clicking here. Registration is free. Through registration, it will be possible for organizers to communicate with potential participants during the course of the contest. First prize: $1,250, of which $1,000 goes to the student or student group and $250 goes to their school’s science department. Awardees will be invited to York in late May or early June of 2018 for an award ceremony. With permission of the authors, winning entries will be displayed at York University and on an associated website. A single-sheet "poster". Even though we refer to it as a "poster", your submission must be 11x8.5 inches (or 8.5x11 inches if you prefer portrait layout) and appear legible when printed out (e.g., generally avoid using font sizes smaller than 20 point; do not cram in text). Each poster should include a title, as well as the names of the students, what grades they are in, their school and a contact teacher at the school. In addition to the poster, you must include a single page (as an additional 8.5”x11” page pdf) that lists all references, whether it be sources of information used or figures present on the poster (unless you created them from scratch yourself). It is imperative that you clearly delineate content you created versus that made by others. All referenced figures and information should be clearly denoted on the poster with a small font (10 point font) identifying superscript number indicating the corresponding reference on the reference page (i.e. endnote-style). These files should be sent to: york.biophysics@gmail.com. The email address above can also be used for those wishing to contact us with any questions. Midnight, by May 1, 2018. The depth of understanding of the topic. How well the physics behind the biology is described. Adherence to the rules of the contest. Make sure figures have sufficient resolution to not pixelate when printed at appropriate size. When using material (e.g., concepts, artwork, figures) that are not your own, it is imperative to provide appropriate citation of the sources. Furthermore, it is important to determine what sources are appropriate versus those that are not. Do not overlook popular and easily accessible sources of information (i.e. textbooks, websites, news etc. ), but should ensure that they are indeed reliable and grounded in accepted fact. Get feedback! The more critical the better. Show your poster to friends, family, teachers, everyone. And get them to tell you what they do NOT like (e.g., "This isn't clear", "I'm not sure that makes sense to me"), and listen carefully. Don't take any critical input personally. In fact, take it as the opposite: It is really valuable! This will allow you to refine/retool (or just as likely, totally scrap and start over again!). The best entries may well be the ones that really capitalize off critical/constructive input received from others.